My first question would be, as usual, what do you understand to be the meaning of “inner song,” and what does this term mean to you? I would say that, for me, that means the conception, not just of each moment, but also of the whole piece. So it has to do with character, story, plot line, not in words, but the story in action—it’s the action, I guess I would say. And then, very specifically, within the piece: what is my mission, what is the composer asking for in that moment of music, what is the point or the reasoning of the story, does this event trigger this event, what is the narrative. So, then, I think it is a question of, once you have a big picture, how to begin. You know, in the military how they have the “pincers maneuver,” it is a military term, but you attack the problem first from one angle, and then you come from another way, so I always think of the approach as: first you try the biggest possible ideas, and then, you come from the smallest, the motive …even the tiniest set of motives. The best example, of course, is Beethoven’s 5th symphony. First from the form, and then from the kernel or motive. I keep trying to come from each way until it meets in the middle …from the big and from the small until it meets together. So, the whole and the part. Right. I think people who are just teaching auralization are only thinking to hear each moment as a sound, that sometimes they don’t incorporate the architecture, the larger narrative. So, inner song, I think the American academics call it auralization, they use the word to mean: “you are hearing it in your head”. So I think usually most of the American say “auralization.” It is essential to have it. You know you can tell, conductors especially, since they aren’t making any sound, you can tell who is really doing it and who really is not. As an example, Bernstein is the greatest auralizer, because you can sense, even if he is maybe not technically the best conductor in the world, you can sense that he has it internalized… he really is hearing exactly what he wants. How can you sense that? Is it because he tells you exactly what he wants? From his cues. From his eyes, from the way he moves, and also in any moment he can sing exactly what he wants… like you said how it started for you, it started with the singing, but then the mechanism comes in the way. I think for him, the mechanism was never in the way. I think he just stayed with his goal, with his immediate ideal of what he’s hearing. What is the connection between auralization and singing then? I think you must sing in order to be able to show anyone else that you have already heard it in your mind. If you can’t sing it, I question whether you really have heard it. If you can’t show them that you are hearing it, no one can help you as a teacher. Unless you can show your idea, somehow, unless you have some mechanism for showing it, then your teacher can’t see what you mean. Until that time, I don’t think that the teacher can really understand your idea. You can’t go directly from auralization to playing without singing as an intermediary? At a very high level of skill you can, but in the training part, I think it is very dangerous if you don’t. If you can’t demonstrate your intent, I would say that you must be self-taught. Why is it different according to your level? I would say that the growth to the highest level, on any instrument or singing, you will need the help of other people, and to get that help, you must be able to share your auralization, share your inner song, so they can know, what you are thinking. And then you can get help, then you can get instruction, you can get teaching, then you have the interplay of dialogue and criticism. I am personally very suspicious with that idea. I think that we should be able to describe where it comes from, how someone gets it. Right. Recently, I was reading an interview with André Prévin, and he was saying : “It was just pouring out. I can’t explain it, it’s subconscious”. To be honest, I am also suspicious with this idea, but I hear it so routinely, all the time, I don’t have a good answer for what it is they are doing, how they are auralization. Yes, I used to play a lot of jazz. Now I don’t have so much time for it, but I like. To improvise. So when you play jazz, how does the music come to you? There is a wonderful thing about that. Do you know Kenny Werner? The jazz pianist? He talks about that process. He talks about…at first you just build, you play the changes, and then you begin to build your own ideas about some improvisation and it stacks…but he says that, at some point when you cross into the real music making, something happens where the subconscious begins to assimilate these ideas, and something different is happening, and you are no longer…what’s his word…he says it’s no longer derivative. It is no longer only synthesis. Something else comes in, he says. From inside. From some subconscious place. So how do you learn to improvise? At the very beginning, you always copy, of course. Like language. The same idea. So what do you copy? You listen and play with a record? You know, I’m old, sometimes we had the records, first you would play some transcription or improvise on the theory. Then you play new chords and maybe add a passing tone. I would say that first we transcribe, write out…say, a Ray Brown line. He is a great example. He was Ella’s husband and music director. A great bass player. You would see, how did he make a solo, and you would write it out, and then play it, and then look, and so you would start to ask, and understand, how did he get here, what was he thinking. That is the beginning process, that’s where a teacher can help, by asking questions, so “where did you come up with this idea? How did you get it?”. But now back to Kenny Werner. We get to the place where you’re allowing, rather than doing….There is a famous J.S. Bach quote about how the mind is computing, when you are playing, the mind is computing, but it will only go so far, and after that, you, then you come to something different. I think it is the same thing about jazz. You can integrate and compute but it comes to a place and then there is some area where it changes to… not calculating, something is coming from the subconscious. Exactly. And natural. And easy. The ‘easy’ is the hardest part. It becomes easy because it is no longer calculating, you don’t make the decisions, the decisions get made somehow. So you are just executing. Yes. From your auralization. From what you are getting. It reminds me of a video where Maxim Vengerov, the violinist, tries to improvise with jazzmen. He gets lost, he is unable to play with them because he is not used to their way of playing? But many times I have seen Vengerov without the score, playing music he knows very well. And he does many things that are not in the score, and he is playing quite freely, not different notes, but…I think George Cantor came up with the idea that there are different kinds of infinity. So there is the kind of infinitiy that comes inside a box, you can go smaller smaller smaller… and it is still a kind of infinity. Or there is a kind of infinitiy on just one plane, you can go in each direction forever, like railroad tracks, but still only in two dimensions. So there are many different kinds of infinity. So I think when Vengerov is playing at his best, I think he is also just playing the same access but within the infinite box of the score or within the ideas of the score. So what does he add? He adds very much: he adds narrative; he shows …certainly ideas that are not only in the score, he will come to one moment and then change a character, or many things. I understand. And do you think that one also learns auralization by being surrounded by music as a child? In my family, everyone is always, from the youngest that I can remember, singing as they do something. I think it’s actually very natural and very human. But I also think that modern society…has made it, not the same…I think we are a strange society, because I think that most human societies have music as part of…it goes together…it’s a part of memorization, it is a way to memorize because we carry information much better if it has a tune. Yes! We also learn the rhythm of our bodies, even sports has music in it, or the sense of flow. I think most human activities are organized by music in the primitive societies. Even the military ideas have music and sounds, and the best way of communicating, not only the data but even the emotion of heroism or retreat is the kind of call whether it is from a trumpet or the signal from a drum. I think it is a very natural human expression. So you think that this musical world is natural. Yes. I think our brains are designed by evolution, so we have the reptile part, but I think from everything else, the next level has something in it that is wired for this kind of music and pitch and rhythm. I think we are designed. So music is from the body. There is a mechanism in the brain, I think. In the same way that we are wired for language, we are also wired for music. I think it is similar, but deeper. Because it is not so frontal. It is not so analytic, it is not so didactic, it has to do with our emotions, our sensation, not yet rational, word thinking. Maybe. But not primitive simple, maybe primitive, but very complex. However, not everyone is very musical, right? That is a hard thing for me, because, even in the music school…I want to believe that there is a lot of potential in everyone to do many things, but sometimes we give students the best teachers, and a loving environment, everything you can give them, and it is hard. Maybe it is different with other kinds of intelligence, but in music, there is…the scale for humans, it is huge. Let’s say you have the bell curve for who can walk, and who cannot walk, as humans… it goes like this. And maybe if you have, you can, with a sense of natural ability, handle language well, then maybe it’s like that. But with music, it goes to the ceiling and the floor. The different levels of capacity, of natural capacity, I think is hugely different with music. And it is sad. It hurts. I have a relative, he just can’t hear the pitch. It’s not his voice, he can tell you if you play something very high or very low, but if you sing just the half step, he thinks it’s about the same note. So it is the perception of music that is different for everyone? Yes. And maybe even the capacity to process. Not just to think of it, but even to realize it, even to understand it, to grasp it. How do you help your students grasp it? We have them dance, we have them do very basic things. Can you march into…? Can you keep a steady beat? So, you put on a pop song…put on Katy Perry, and say, ‘ok, tap the beat!’ And sometimes they can’t, they can’t even find where the bar is. I used to think it was a question of early childhood training, but even some young children…we try everything we can to give them the opportunity and… it doesn’t work in the same way. It is funny, we are back to our original thought about where the music is coming from. I remember in 1984, I was on tour and I was in Helsinki. There’s the very famous pianist now, Olli Mustonen, and he was maybe 11 years old, and from memory, every night he would play a different Sonata, Beethoven, Chopin, he never had any score. He looked at it, he could hear it in his head, and played. 11 years old! And I remember, for me, that was the first time I thought: “ we will never understand it”. There is something hidden. So you can go the spiritual route, or you can go the evolutionary, the brain route, but there’s something…at that moment, I thought:” you can’t explain it”. As a teacher, I always want to know ‘how.’ I want to know how it works, how is he doing it, that’s the first question we always think as teachers, but my life experience has taught me I can’t explain it, especially when you see Midori ,the violinist? She was 7 years old, she had memorized major concertos, and she was not only a “trained monkey,” just doing what she was told, already she was making a phrase, she found a place where there’s a chord she can’t possibly analyze yet, but she knows there’s that great change of sound. Exactly. And how to teach? And share? And get someone to understand that? It is very hard to teach someone how to feel the music, but you always can teach someone how to express a feeling. Sometimes it is the instrument that is the obstacle. That requires the physical mastery. That’s mechanics. You can teach that. That sort of mechanics, the physical mastery, in my opinion, it not a gift, but a skill. The mastery is simply a question of understanding means, not ends. You can teach the movements, but people try to teach them too fast. And they also teach them psychologically wrong. It has to come from a place of first finding that it’s easy, it’s enjoyable, it’s fun. It always has to be something that is enjoyable. And that I think grows, where it is, the natural place, that area can be developed. But if you go always from that, from the line, the mystic place, if you move away from it, to just learn mechanically, usually it doesn’t work, I think. We also have to find a good connection to the instrument. True. The bass, the French horn, are the most impossible to connect with, they say, when you first start. There’s the very famous saying about the French horn and the bass, that they are the easiest to play badly. But to make good, real music with them…you know, like your voice, we spend our whole lives becoming natural with them. We use it everyday. This is easy to be natural. To make any instrument equally natural is the goal. So that it feels the same as using your voice. So that immediate auralization is happening here, when we speak, we do exactly the same—it’s what you were talking about. It is no different from the way we speak, is also the way we make music, when we have become natural with our instruments in the same way as we have become natural with our speaking voice. And I suspect that is the same mechanism probably neurologically. I have the sense that this connection with the instrument has a lot to do with affection. We choose an instrument because we are called by it. I agree with that. And you know there are personality types for each instrument – NO question! Absolutely, And sometimes you see people mismatched; someone who should had been a horn player for example. Yes. Absolutely there are instrument – personality stereotypes. There is no question. I read jokes about that, but I didn’t know it was true! So when there isn’t a connection with the instrument we are called by, what exactly? I think it is a matter of finding the technical regime, that they must spend the time, a lot of time, with ‘the acquisition of natural,’ I call it. Just like with any athlete, it is the time of…you know, the famous 10,000 hours. How to they achieve excellence? Right. He talks about, in any field–music, hockey, anything–that requires the ‘acquisition of natural,’ it takes 10,000 hours, he says. Yes, but intelligent use of time to train that sense of natural behavior. The same way we learn to hear an idea in our minds, to develop this idea, and then for it to come naturally, with ease of expression, he says is the same for any kind of activity. So how can you be natural with something that you don’t invent? I can imagine that it is not the same if you improvise and it comes from you. But what about if you interpret something written by someone else? In that case, if you improvise, you hear your idea—you know that you must translate it to an idea, a musical idea, and not only the task. One of the first things we learn is: if you see that your entrance is coming, it cannot only be a g-sharp half note. It must be: what is the character? Is it crescendo, is it diminuendo? Is it a new harmony? Is it simply doubling something else? What is my role? And we hear it first, before we play it. So that the score is not enough. You must take it inside first. So you auralize first and then you play. Yes. It can never be that you play well without already having an idea of your role. Sometimes you are the soloist in the Bach cello suite, it is all you but in the group, you have to hear yourself within the big idea. Is it a type of psychological preparation? That’s a good word. You participate in that moment, and then you are not participating but still in your mind you are preparing for your next chance to find your role. That is also the part of the conductor. Because then if you get the right cue and you get the right character, the conductor can help you with your psychological preparation. So if you are about to play, and let’s say it is Daphnis, and you have the cello solo coming up, and the conductor has your attention before your entrance and he shows you a kind of movement, or another one, you will play so differently…feel a different sensation. Yes. Also with his facial expression. With the way his hips move, how he moves from them. Everything is a part of which character will you play. But some composers use very complex gestures, and others are very simple. Right. Depending on your players and the music of course it can be very different how it can work. With the very big orchestras, they have to function as a large chamber orchestra also, in some way, where there is no conductor, and the conductor is only there for assistance, or when the conductor is really there to shape everything. So that situation can change according to the type of orchestra there is. Is it a big or a small orchestra? Young or experienced people? How is the acoustic? The preparation right beforehand means a lot. It can never be play, listen, play, listen. It has to be hear, play, hear, play. That is for practicing and evaluating, but not for performing. What is your attention focused on when you first hear, then play? Listening for analysis, the ‘play, listen,’ evaluate, it is a special kind of preparatory practice. But it is not good music making. Very useful. We must analyze, of course, and be self-critical and understand what we do. But if you are doing that in a concert, it is not music. Yes. It’s a practice method. An analytical method. In the best way, if you can…in the best, you can do everything, but you also then have to be less active mentally. It has to be natural like you are talking about. In the best playing, it is intention and not analysis. And then your body naturally carries out your intention. Even when you are playing jazz? If you improvise together, with a group, you don’t analyze. So we have agreed beforehand on the structure. And mostly, we’ve agreed on chord changes, but people can alter the chord changes too, and you have to listen for the chord changes. And then you can do free sometimes, if you know each other better. For each player, the intention is what makes it great. If you are the drummer, I think if your intention is to listen and to support whatever the bass player is doing, again, we’re back to what is your intention in that moment. And you are adjusting according to what the others are doing. So your intention is not rigid. It can be modified. Right. The key there is the hyper awareness. It’s a kind of awareness that is predictive, if someone does something, you notice, “oh, I know what he is trying to do now.” But the hyper awareness comes because everything else is natural. Your attention is not placed on, “where is he sharp? Am I rushing?” That becomes so natural that you have the awareness—your awareness can be about the other three people. You have space to listen to other people. And in that space we are again, in that grey, non-analytic… where things just seem so natural. 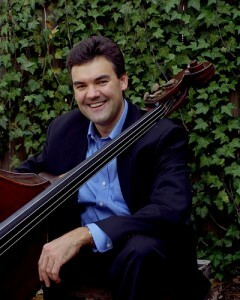 In jazz, the bass player is often the one who supports the rest, and the sound is smaller. The saxophone is stronger, for example. In that case, how do you support others, or understand your role, in this situation involving smaller sound? You have to find out how much stability they need. If you are the drummer, if they are hyper aware, then as a drummer and as a bass player, you have more creativity. But, sometimes you sense that the sax player is a little more individualistic, so then you will support him more carefully and be sure that you keep him in the box. On the other hand, if he also is very aware of what’s happening, the drummer can begin to do other things. Your freedom depends on what the other needs and what their personal needs are. A jazz group that rehearses more can play a much different kind of music than players in a sit-in sort of situation. As a bass player sitting in, you have to be very strict with yourself. Without rehearsals, you can end up in trouble. It depends on how complex or how artistic you want to be, but yes. We think of jazz as improvisation, but in the best, most sophisticated sense, it takes quite a lot of rehearsals to know what do you need and so one. Do you often separate your jazz practice from your classical practice? For me, they are not so different. For me, I always think of them in terms of the box. The box, for classical music, we have parameters. The composer is assuming that you will play a certain way, and he will give you some instructions, but inside those instructions you still have some great creativity, and can still make natural music, and it can still feel, to a listener, natural like jazz. But, let’s say we go to blues, still you are in quite a box, it is just the form is the box. Now you have freedom of notes, but still the rhythm, the form, the chord changes are actually more of the box, because you must stay in the same key unless you rehearse some change somewhere. You play the same progression all the time. So it’s a different kind of box. Then, if you go to play “all the things you are”, it is still a box, there is some freedom now to change the chords a little, you can make a longer introduction, but you still have a form that is still in a way not so different from a Mozart Symphony. You still have an idea of music, and everyone agrees to play within that box. To some extent, you still have the same narrative structure. But within that, there is still a tremendous amount of freedom to make a natural phrase, to create a gesture that seems the same as it has always been. Here is the rhythm, here is the note, here is the narrative, and it is still the same. Do you adapt your idea to that of the conductor? It is greater than that. We collaborate with him. He gives us the idea, but there is room for everyone to think, ‘where is my partner phrasing here,’ (my stand partner or my section), ‘how are we doing this together?’ And then, in rehearsal, we might realize that here, the cellos go away from that note, we must make a stress here, etc. It becomes less about the conductor, and more that we take into account what he does. I understand. But the rehearsals don’t always include the full orchestra, right? Sometimes, but these days, mostly, most of the time we all play together. But for the university orchestra, we also have section rehearsals. As a teacher, what is the most important thing that you teach your students? The most important thing is that they learn to be expressive and narrative. And of course, to do that, they have to know before what they will express. Basically, I ask them to do their very best to give the spirit of the music, of course that means a lot of technical work for them, because they have to prepare themselves so that they can, in that moment, make good, meaningful music and not simply task orientation. Especially our society right now is very geared to: just, you sit in your cubical and you do your task. And I try to take them away from that. Doing a task is different than giving meaning to something? And to give meaning to what you are playing, sometimes you have conflicts of interpretation, right? Yes. For me, you have to study as much as possible about the composer, the piece, what he wanted, and it is always a negotiation, I think. Even if you have a dictator of a conductor, and young people who want to do whatever he says, even then, it is always still negotiation. You have a reach a consensus: this will be the strong place, this will be where Stalin crushes everyone, this will be the moment of suffering; this will be the child… Also I think, In this setting, in the University Orchestra I have a good freedom, because we have a lot of rehearsal; downtown, in the PSO… it has to happen quicker, so for efficiency, then the conductor just says do x…maybe there’s a little less consensus, but the best conductors are very good at understanding the consensus right away. Do you think there is a relation between your feeling and your culture? In the PSO, sometimes you hear our brass players, they are quite masculine, and they are Americans. You can hear it. You can guess where the orchestra is from? Yes. Sometimes we turn on the radio, and ask, “Who can guess where the orchestra is from first?” Like, ‘Oh, it’s Viennese!’ Because the Viennese, they are so like, almost lazy, laid back, for example. There is a national character. A cultural character, yes. If you hear the Chicago Symphony, you can hear the Mid-Western character. Or, I am not a huge fan of the NY Philharmonic, I don’t think it’s one of the really great orchestras, but it is such a huge melting pot, you can hear that, no one is really sure if they’re right, and I kind of like that, it has a more blended quality sometimes. The same with a soloist. Yes. You can hear Rostropovitch immediately. You get it by searching for it? By searching for your own sound? I think you get it by having an intention for a sound. Now of course, you develop your sound over time, but eventually, even that is an intention, I think. I understand. Thank you so much, it was a pleasure to meet you and I am very happy with our encounter. See you soon, I will regularly come to your recitals with the PSO !